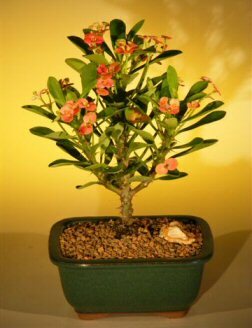 The Crown of Thorns is a spiny, succulent bonsai that flowers nearly all year. The common name alludes to the legend that the euphorbi milii worn by Christ at the time of his crucifixion was made from stems of this plant. The red / Salmon flowers are small and the brightly colored modified leaves (bracts) found just beneath the flowers are quite attractive. Very easly indoor care. Requires water only weekly.